ANNAPOLIS, Md. 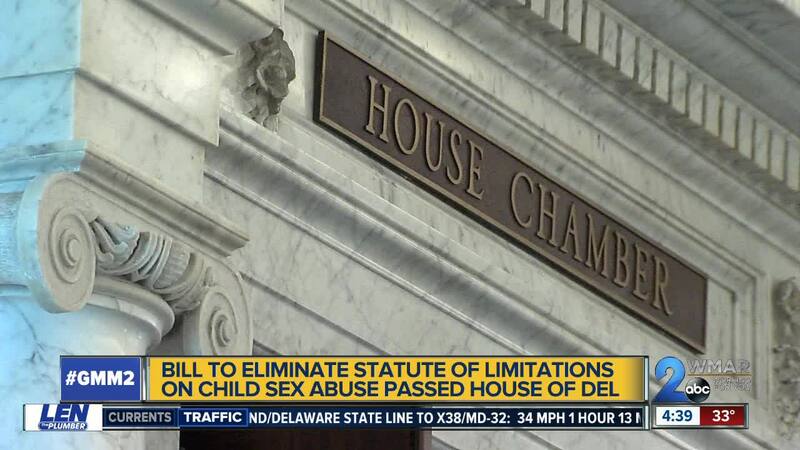 — The proposed bill to end the statute of limitations for child sexual abuse victims has been approved by the House of Delegates 136-2 on Monday. The bill, also known as HB687, aims to remove the statute of limitations for all new offenses of child sexual abuse in addition to providing a two-year window that would allow all past victims, regardless of age, to bring cases forward. The hope is to allow past victims a chance at justice. The current law says, for child abuse, you have 20 years after you have reached the age of majority. Last month, members of S.N.A.P., Survivors Network of those Abused by Priest were joined by Jane Roe of The Neflix Documentary 'The Keepers' to rally the bill. They held up pictures of victims at the age when the alleged sexual abuse took place. The bill will now make its way to the Maryland Senate where it is expected to face tougher opposition.